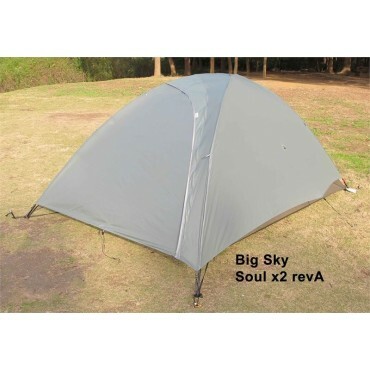 Rent a 6-Person Tent and Other Camping Equipment. Gear Shipped Direct to You Anywhere. About 18 pounds; 10' wide and 6' at peak . . .
Our six-person "family camping"/"car camping" tents are solidly built to withstand punishing weather - to keep the elements outside where they belong. You may think you can just buy a cheap tent down at a big box store for not much more than renting, and you can. Just hope it isn't windy or it doesn't rain, or that you ever have to use the zippers on those cheap tents more than once. If it wasn't for those little caveats, a big-box-store house brand tent is just fine. But we rent real tents. We also have 2-person, 3-person, 4-person, and 5-person capacity versions for car camping, mostly from Alps Mountaineering, a USA manufacturer that supplies a lot of Scout troops - we like them too, for durability and reliability in harsh weather. All are easy to setup - one person can have any size tent up and in use in a matter of minutes. There are 2 simple crossbars that hold up the body of the tent, and another pole or two for the waterproof cover - the "fly" (no idea why it's called that). These tents are free-standing (no stakes required), and can be moved around even after setup. However, any tent can be staked with the provided pegs if needed to better resist wind. Instructions are sewn into the stuff sack for reference when needed. 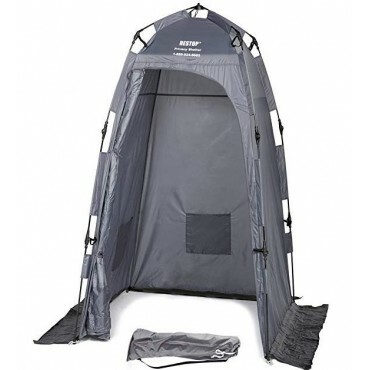 This is a two-wall tent: the tent body, which includes some mesh material on the walls and ceilings for maximum ventilation, plus a waterproof fly cover that goes over the body for protection against rain and provides more insulation. You can leave the fly off if assured of a dry evening. Each version of this tent has two doors, which allows easier in/out access for campers - no more stepping on each other on the way out for a middle-of-the-night bathroom break! 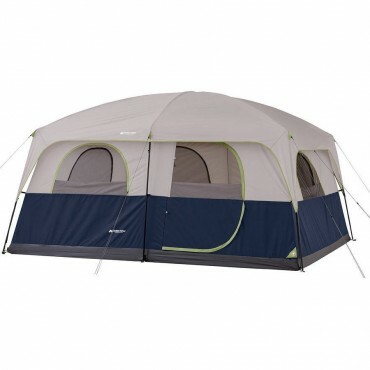 These tents are our recommended versions for large group outings such as retreats, family reunions, and parties. We have served up camping gear for as many as 250 people at one event with these tents! 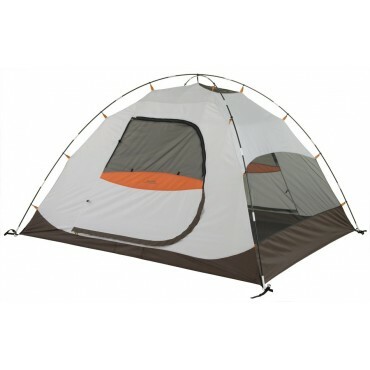 The specs for each car camping tent we carry follows. The listed capacity will house that many adults sleeping on standard-size mattress pads, but we recommend for comfort and practicality to leave yourself some elbow room and camp with no more than 1 less the capacity - that is, no more than 5 adults in a 6-person tent for example. If you just want some sun and rain protection for a day outing or picnic, rent our screen tent. Manufacturer Specs: (note: weight may vary some as packaged for rental. L/W dimensions are maximums at either side and may not be that long or wide the entire side of the tent. The interior height listed is usually at just one peak point and will slope lower from there. These "car camping" tents are generally intended for uses where weight is a non issue - camping at some spot near your van or car for example as opposed to backpacking in somewhere. But you could split up the parts to these larger tents among a few hikers to backpack in to a remote camp site if you were willing to share a tent - it would save money over several backpacking tents. But it can sometimes be hard to find a good camp site in the back country big enough for the 5- and 6-man tents. Not every tent use is in the wilderness; this tent is a popular one rented by music-festival-goers as well.The peak interior height in some of the larger ones is enough to stand up in, but don't walk inside the tents with your shoes on or you could poke a hole in the floor that will cost you to repair. We have lots of advice about the great outdoors including more information on tents and shelters for camping and backpacking such as how to choose the best tent and how to find and make a good camp site. Not every tent use is in the wilderness; this tent is a popular one <a href="/festival_camping_gear_rental" target="_blank" rel="noopener noreferrer">rented by music-festival-goers as well</a>. More for day use, not camping - no floor . . .